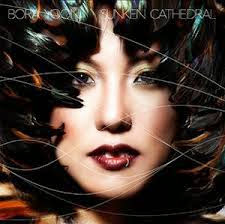 Composer-vocalist-instrumentalist Bora Yoon creates a contemporary music born of attention to the body and its inner workings and the analogous structure of particular buildings. Composition and subsequent performances take place within these spaces. Yoon's music seeks to irradiate outwards from this vision. Or at least that is what I gather from reading about her. The Korean-American TED fellow gives us 12 fairly brief pieces in her Sunken Cathedral (Innova 880). Most center around her vocalisms, which are sometimes wordless, mostly rhapsodic, and sensual in their attention to sonic universes. The music has a quasi-ritualistic, sound-scaped quality born of a mixture of tonality and sound poetry. So we have the natural sounds of bells, birds and such, a cathedral organ here, percussive tinkles there, field recordings, electronics, and other evocative musical and non-musical elements to in each case tell a story in sound. It would not be far off to suggest that there is an Asian feel at times in the use of sound and silence and how they work together to embody a quality of motion-within-restfulness. Some works were commissioned for performance in certain spaces, such as a large military drill hall inside the Park Avenue Armory in New York, or the McCarren Park Pool in Brooklyn, and understandably these pieces make use of the natural ambiance entailed. In any event ambiance is more or less a constant regardless. All the pieces evoke, but not all are equal. The high points are in part cushioned by waystations that may not stand perfectly well on their own but contribute to the total experience of the sequence. There are guest artists in addition to Ms. Yoon, percussionists, recitation artists, the four-member vocal group New York Polyphony on one piece, and an instrumental ensemble of seemingly large proportions, Sympho, here presented a bit at a time for the brief "Speratus". At the end all flows together in segment-after-segment, leaving one with the feeling of having journeyed to a place, a space that is rather special, both performative and landscaped inside and out. It has the quality of the universally personal, which in fact is what Bora Yoon offers to us in this suite of pieces. There is a poetry here of the celebration of existing within the emotional and experiential ups and downs of a life today. Somehow Ms. Yoon conveys that to us in this collection of works. You are left with an impression, the presence of a sound-artist composer with her own sensibilities, creating sometimes fragile, luminous assemblages, sometimes sound worlds girdered about with a more solid framework. Is this a new medieval new age music? Not really. It is of today. It is music of a post 9-11 world, a world where one resumes the identity-forging process but nothing is quite the same. Recommended.